Have you ever been jetlagged? I know I have. Many times. Sometimes it’s only a little, and sometimes it’s a total killer and leaves you feeling a bit stranded, confused and oh so very tired for weeks (like my trip last year from Sydney-San Francisco-New York over just a few days). But you’ll be pleased to know there are a few things you can do to make the jetlag a little less destructive, so you can get back to normal as soon as possible and not waste any of your precious travel time by being so exhausted because you couldn’t sleep until 3am and woke up only a few hours later. Thanks internal body clock. 1. Set your watch/phone to the time of your destination as soon as you get on the plane. This will help your brain (and thus your body) to get to grips with what time it is in the place you’re heading to early on, so by the time you get there you’ll already be running on the right time in your head. 2. Rest/sleep as much as you can on the flight. I’m pretty much never able to sleep on planes, and I hugely envy you if you are one of those people who can sleep anywhere, but if you can, sleep away and arrive at your destination feeling rested and fresh! 3. Don’t succumb to your tiredness as soon as you arrive at your destination. If you fall asleep in the middle of the afternoon, you’ll never sleep that night, only perpetuating the jetlag cycle! 4. Eat your meals at actual meal times. Nothing tells the body what time it is like a proper meal. Breakfast in the morning, then lunch and finally dinner (duh) will set you up nicely for a good night’s sleep. 5. Force yourself to get up and out of bed fairly early in the morning (to me this is around 9am). Start your day bright and early to jumpstart your own body clock and get back into a normal rhythm. 6. Go outside. I know when you’re tired it can be tempting to just laze around all day in your PJs, but you need to get out into the sunlight and prove to your body that it’s supposed to be awake right now! 7. Try to get to sleep before midnight. I know it’s not really possible to force yourself to go to sleep, but there are a few things you can do to help the process – make sure the room is dark, turn off any screens, and maybe even have a nice relaxing bath beforehand. 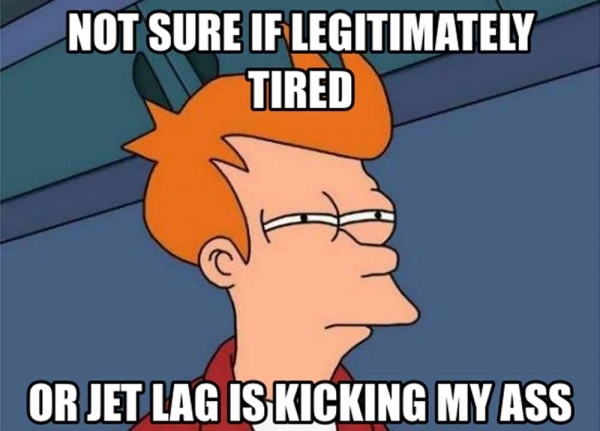 What other tricks and tips do you have for dealing with jetlag?